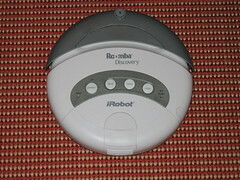 About a week ago I bought an iRobot Roomba Discovery. So far, I’m pretty impressed. You don’t get the thoroughness from wielding, say, a Dyson, but it does a good job. Also, there’s something quite enjoyable about starting the little guy up before I go out and coming back home to a clean floor and to find him quietly recharging at the base station. Incidentally, I call him Sweepy. Probably a bit too obvious a name, but it works for me. Of course, I’m not kidding myself, owning a robot is as much fun as it is practical. I’ve always loved robots since I was wee and owning one that cleans up after you, well, it feels like living in the future that I used to think about when I was a kid, you know?